I promised you all that I would take loads of pictures and report back about my time at the festival but I may have sort of forgotten to get my camera out quite as much as I should have. Our old friend the British weather decided to get in on the festival action by providing several prolonged heavy downpours which made the event harder work than our long-lost friend Mr Sunshine would have done. This was my stall all laid out on the Wednesday, before being opened to customers. 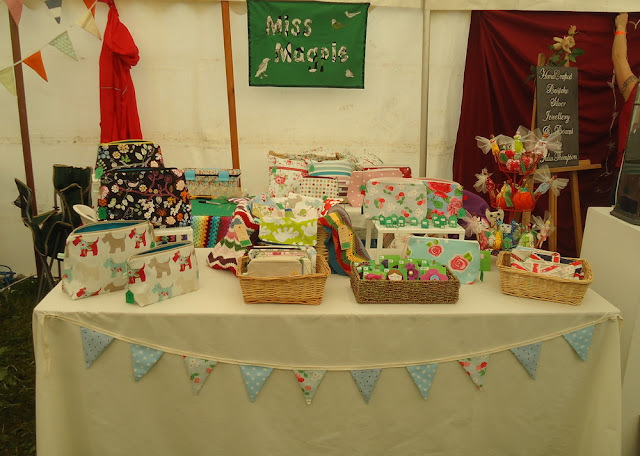 I went with pretty much the same layout I had used in the last few fairs I did, but having seen some of the other stalls, I think I will make some changes in the future. Below you can see my stall in the evening. I was lent a lamp, which did make a big difference. I had not thought I would need any extra lighting as the marquee was lit, but I see now that individual stall lighting can be really effective and next time I would definitely dig out the fairy lights. In the picture below you can see some of the other stalls. The jewellery stall in the right of the picture was to my left. It belonged to the fabulous Annette, who became my festival heroine. Annette is a Larmer Tree veteran and was full of good advice and information, not just about Larmer Tree but about running a craft business and life in general. 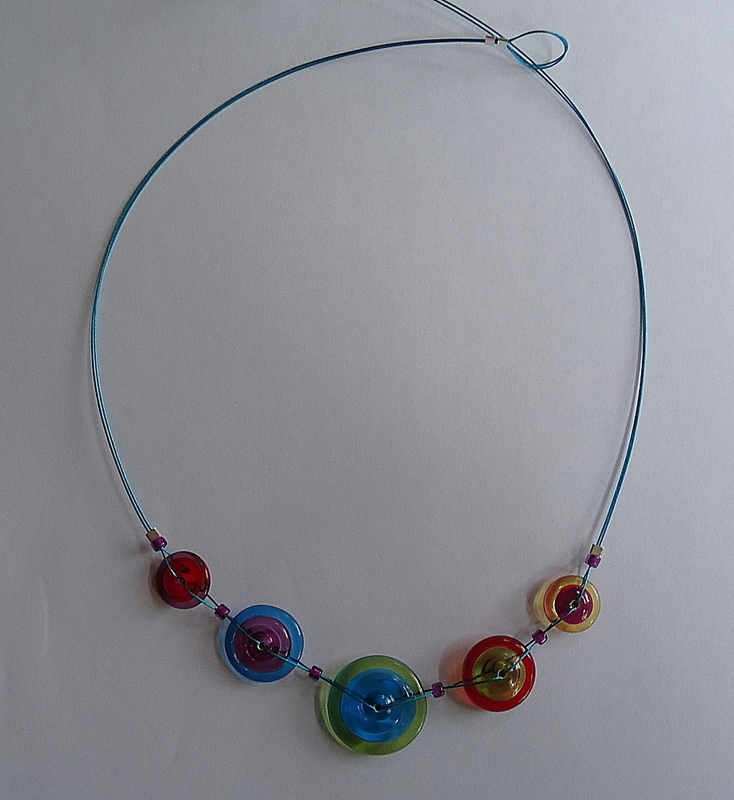 Annette's jewellery is made from handmade glass and is just so colourful and gorgeous that I couldn't resist spending some of my profits on a few pieces. I even got to design my own necklace, which wasn't as easy as you might think. 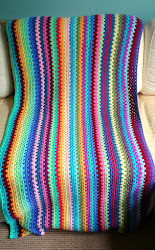 It took quite a while to choose which colours to include, in which size, and in which order, but I love the finished piece. Please go and have a look at Annette's website, Wild Scarlet. You won't be disappointed. 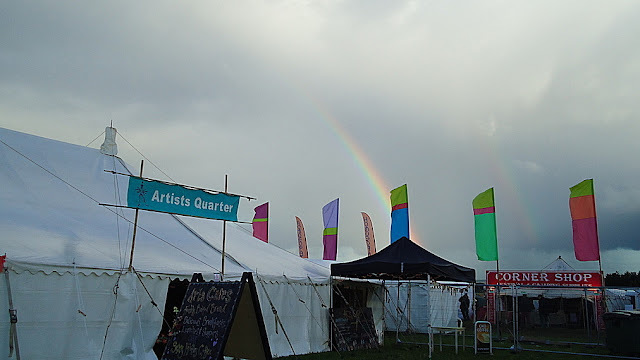 The festival itself is held in a really beautiful setting in the Dorset countryside and the organisers did a fantastic job of getting us all on site and into place. We got to camp directly behind the marquee and even had access to showers! Unfortunately for us, we had decided against taking our own marquee-like family tent as it is really huge and we were concerned about it getting ruined. We opted to take our old, much smaller tent, which turned out to be a mistake as it proved no match for the torrential rain we had over the first few days and leaked like a sieve. Mr Magpie was understandably less than keen to spend his holiday sitting in a muddy puddle so we made the decision to return home for the night and ended up commuting to the festival daily for the duration. Initially the rain helped to drive people into the marquee for shelter and was quite good for business; Thursday was my second best day sales-wise. However, it soon worked against us as the lush green fields we arrived to turned into a brown swamp during the first 48 hours. To reach the Artist's Quarter you first had to cross a sea of mud, and many people chose not to do so. I don't really blame them. Indeed, I was so reluctant to cross myself that I made only a few trips into the rest of the festival and failed to see a single band or comedian all weekend, which had not been the plan at all. Talking to the other traders, most of whom had been to Larmer Tree before, it seemed as though business was slower for most people this year. I know that this was the first year that tickets for the festival were still available as the gates opened, and from chatting to the visitors, many were planning on leaving early because of the mud. I didn't sell as much as I'd hoped to, but I was happy with my takings all things considered and would definitely be up for a return visit next year if invited. The kinds of things that sold well at Larmer Tree were different to my usual best-sellers and I think I'd have a better idea of what to take next time and what changes to make to the stall. Interestingly, although I displayed my fruit pincushions with a couple of decorative pins in, I didn't label them as such. I priced each item individually instead of my usual 'Fruit Pincushions £5' sign. Last time I did a fair I sold a dozen of them; this time only about five over the five days! It does seem that you really do have to spell things out for your customers! All in all, I found the festival experience much more satisfying than selling at craft fairs. I have been on a steep learning curve and this experience taught me loads, as well as introducing me to lots of really lovely people. For now, I am going to enjoy the last week before the children break up. I have got a few little sewing treats planned just for myself, as well as a bit more knitting and crochet. I can now resume Granny-Striping, yay! If you were at the festival, I hope you managed to enjoy it and would love to hear from you with any thoughts you have on my stall. Glad to hear you enjoyed yourself and did well. I was thinking of you over the weekend. OMG that mud!!!!! I actually gasped when I got to that picture. It's so awful when the weather plays silly beggars, but you've just got to get on with the show! I'm so glad you managed to get a lot out of it and make some decent sales. You've worked so hard towards this so I hope you manage to enjoy the summer and then possibly prepare for the Christmas fairs? ?